Phase 1 occurs approximately 18-24 months prior to the diagnosis of cancer. This is where the individual with cancer experiences an "inescapable shock" or acute psycho-emotional trauma, affecting deep sleep and the production of melatonin within the body. Melatonin is the primary hormone responsible for inhibiting cancer cell growth. Produced by the pineal gland during deep sleep, melatonin inhibits cancer cell growth through the on-going production of interleukin 2 (IL-2), which governs white blood cell immune activity and protects against microbial infection. Without enough melatonin due to prolonged chronic stress affecting deep sleep patterns, cancer cells thrive. As discovered by Dr Ryke Geerd Hamer (below) every cancer has a different and very specific psycho-emotional cause; whereby a part of the emotional reflex centre in the brain is damaged as a result of the prolonged psycho-emotional trauma. And as each part of the emotional reflex centre in the brain controls and is connected to a different organ of the body, as this emotion centre breaks down experiencing necrosis, so does the organ it controls leading to cancer. Over the past decades, a number of licensed medical practitioners working in the field of oncology have discovered cancer is preceded by a specific emotional trauma, occurring approximately 2 years prior to the diagnosis of cancer. Two of these practitioners include Dr W Douglas Brodie, founder of the Reno Integrative Medical Center in Nevada, USA and Dr Ryke Geerd Hamer, a German physician and founder of German New Medicine. Both of these practitioners claim to have examined thousands of cancer patients in reaching this conclusion. More specifically, Dr Ryke Geerd Hamer proposes that each cancer in the body has a different emotional cause which he had identified; in other words the emotional cause for cancer of the left breast is different to that of the right breast and to cancer of the colon, etc. In my own personal experience in treating hundreds of cancer patients to heal the root psycho-emotional cause of their disease, it has been my observation that Dr Ryke Geerd Hamer's theory that each cancer has a different and very specific psycho-emotional cause is 100% accurate. For example, I always find a woman presenting with cancer of the left breast has [in line with Dr Hamer's theory] experienced a psychological and emotional conflict / trauma approximately 2 years prior to the diagnosis of cancer involving the "mother, child or home". Similarly, I always find a woman presenting with uterine cancer has experienced a "sexual conflict" 2 years prior to the diagnosis of cancer, and so on. On a personal level, my own mother [who was diagnosed with cancer of the left breast in 1992] experienced a psycho-emotional trauma 2 years prior in 1990 involving the death of her mother, in line with Dr Hamer's theory. I remember her telling me at the time she felt like a zombie for many months. As is typical with patients I see, my mother had a tendency to over-react to most difficulties in life and was always highly stressed, and it is this hypersensitivity to life's stressors that makes one susceptible to cancer. Dr W Douglas Brodie reveals it is not the stressful event that causes cancer, but our inability to cope with life stress. The Cancer Personality, by Dr W Douglas Brodie: “In dealing with many thousands of cancer patients over the past 28 years, it has been my observation that there are certain personality traits present in the cancer-susceptible individual. These traits are as follows: 1. Being highly conscientious, caring, dutiful, responsible, hard-working, and usually of above average intelligence. 2. Exhibits a strong tendency toward carrying other people’s burdens and toward taking on extra obligations, and often “worrying for others.” 3. Having a deep-seated need to make others happy. Being a “people pleaser” with a great need for approval. 4. Often lacking closeness with one or both parents, which sometimes, later in life, results in lack of closeness with spouse or others who would normally be close. 5. Harbours long-suppressed toxic emotions, such as anger, resentment and / or hostility. The cancer-susceptible individual typically internalizes such emotions and has great difficulty expressing them. 6. Reacts adversely to stress, and often becomes unable to cope adequately with such stress. Usually experiences an especially damaging event about 2 years before the onset of detectable cancer. The patient is not able to cope with this traumatic event or series of events, which comes as a “last straw” on top of years of suppressed reactions to stress. 7. Has an inability to resolve deep-seated emotional problems/conflicts, usually beginning in childhood, often even being unaware of their presence. Typical of the cancer-susceptible personality, as noted above, is the long-standing tendency to suppress “toxic emotions”, particularly anger. Usually beginning in childhood, this individual has held in their hostility and other unacceptable emotions. More often than not, this feature of the affected personality has its origins in feelings of rejection by one or both parents. Whether these feelings of rejection are justified or not, the individual perceives this rejection as real, and this results in a lack of closeness with the “rejecting” parent, followed later in life by a lack of closeness with spouses and others with whom close relationships would normally develop. Those at the higher risk for cancer tend to develop feelings of loneliness as a result of their having been deprived of affection and acceptance earlier in life, even if this is only their perception. They have a tremendous need for approval and acceptance, and develop a very high sensitivity to the needs of others while suppressing their own emotional needs. They become the "caretakers" of the world, showing great compassion and caring for others, and will go out of their way to look after others. They are very reluctant to accept help from others, fearing that it may jeopardize their role as the caretaker. Throughout their childhood they have been typically taught "not to be selfish", and they take this to heart as a major lifetime objective. All of this is highly commendable in our culture, but must be somehow modified in the case of the cancer patient. A distinction needs to be made here between the "care-giving" and the "care-taking" personality. There is nothing wrong with care-giving, of course, but the problem arises when the susceptible individual derives their entire worth, value and identity from their role as "caretaker". If this very important shift cannot be made, the patient is stuck in this role, and the susceptibility to cancer greatly increases. As already stated, a consistent feature of those who are susceptible to cancer appears to be that they "suffer in silence", and bear their burdens without complaint. These burdens of their own as well as the burdens of others weigh heavily upon these people through a lifetime of emotional suppression. The carefree extrovert, on the other hand, seems to be far less vulnerable to cancer than the caring introvert described above. How one reacts to stress appears to be a major factor in the larger number of contributing causes of cancer. Most cancer patients have experienced a highly stressful event, usually about 2 years prior to the onset of detectable disease. This traumatic event is often beyond the patient's control, such as the loss of a loved one, loss of a business, job, home, or some other major disaster. The typical cancer personality has lost the ability to cope with these extreme events, because his/her coping mechanism lies in his/her ability to control the environment. When this control is lost, the patient has no other way to cope. Major stress causes suppression on the immune system, and does so more overwhelmingly in the cancer-susceptible individual than in others. Thus personal tragedies and excessive levels of stress appear to combine with the underlying personality described above to bring on the immune deficiency which allows cancer to thrive." Dr Ryke Geerd Hamer discovered a connection between cancer and unresolved psychological / emotional conflict through first-hand experience. His son was murdered and soon after he developed testicular cancer, which he identifies as the result of a "loss conflict". From this experience, and as chief of internal medicine in a gynecology-oncology clinic at Munich University, he was able to interview and examine the records of thousands of cancer patients. His research led him to identify the presence of concentric rings in the emotional reflex centre of the brain as being evidence of the psycho-emotional trauma on the brain itself, which he called "Hamer Herds". 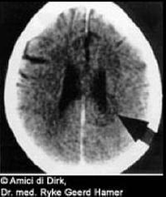 He proposes the location of the Hamer Herd (HH) on the brain which is seen through a CT scan, is like a map, which to the trained practitioner can reveal the precise disease and its organ-location in the body. Dr Hamer offers images such as the one below, as evidence of these concentric rings or Hamer Herds. Dr Ryke Geerd Hamer: "Every cancer or cancer-like disease originates with a very difficult highly acute, dramatic and isolating shock. The experience of shock is simultaneous or virtually simultaneous on three levels: 1. the psyche 2. the brain 3. the organ. The development of the conflict determines a specific development of the HH (Hamer Herd) in the brain and of the cancer or cancer-equivalent disease in the organ. There are very specific signs which clearly distinguish the ordinary conflicts and problems in our daily lives. From the very first moment of a DHS (psycho-emotional trauma), you would experience continuous stress on the sympathetic nervous system. The symptoms would include cold hands and/or feet, loss of appetite, weight loss, sleeplessness and dwelling day and night on the conflict content. This situation will only change when the conflict has been resolved. In contrast to normal everyday problems, we see the patient falling into a lasting stress phase that will cause specific symptoms and a growing cancer. The HH (Hamer Herd) in the brain, which is immediately visible, shows that the patient's psyche has very precise, defined symptoms that cannot be overlooked. I discovered the ontogenetic system of tumors and cancer-equivalents after observing about 10,000 cases. I worked absolutely empirically, like a good scientist should. I documented all the collected cases and the CT scans of the brain with their histological findings. Only after I had put them all together and compared them did I see that there was a system. I didn't really occupy myself with this until 1978. I was a doctor of internal medicine and had worked in university clinics for fifteen years, five of them as a professor. Then a terrible thing happened: while asleep on a boat, my son Dirk was shot, for no reason, by a madman, an Italian prince. This was a terrible shock for me, sudden and unexpected, and I was powerless to react. Every day events or conflicts don't usually catch us so "off guard". We generally have a chance to anticipate the normal conflicts that we face in life, but the conflicts we are unable to prepare for and which cause this helplessness and inability to react, create, in essence, a panic shock. We call these biological conflicts. In 1978 I developed testicular cancer from such a biological conflict, a so-called "loss conflict". Since I had never been seriously ill, I wondered if my condition had anything to do with the death of my son. Three years later, as chief of internal medicine in a gynecology-oncology clinic at Munich University, I had the opportunity to study female patients with cancer and to compare my findings to see if their mechanism was the same as mine; if they too had experienced such a terrible shock. I found that all of them, without exception, had experienced the same type of biological conflict as I had. They were able to recollect the shock, the resulting sleeplessness, weight loss, cold hands and the beginning of tumor growth. There is at present a movement to divide medicine into organic medicine and psychological medicine, or psychotherapy. When a doctor states that there is no organic cause, he is giving the psychotherapist a free hand to treat these 'clean' psychological diseases. Such division is absurd in the eyes of a practitioner of the German New Medicine, because illness cannot be divided and parcelled out. The psyche, brain and organ are three levels of the same organism and the course of events on them is always synchronous." Studies below show a correlation between extreme suppression of emotions (primarily anger) and a highly stressful life event preceding the onset and development of cancer. Studies below show expressing and releasing toxic negative emotions (such as anger, hate, resentment, grief) increases the survival rates of cancer patients significantly. While most people cope with stress with relative ease, those susceptible to cancer appear to be highly vulnerable to life's stresses and traumas, and feel unable to cope when life throws a curve-ball their way. These people are perfectionists and live in fear of conflict, stress and loss and are deeply frightened of negative events. And when faced with a highly stressful or traumatic event they have not anticipated, which inevitably happens during their life, react adversely and are unable to cope. They experience "inescapable shock" and feel trapped and unable to escape from the painful feelings [of anger, hate, resentment and/or grief] associated with the traumatic experience. Stress hormone cortisol levels skyrocket and remain at high levels. High stress levels generally mean a person cannot sleep well and cannot produce enough melatonin which is produced during deep sleep usually between the hours of 1am and 3am in the morning. Melatonin is the primary hormone responsible for regulating the immune system, and when there is not enough melatonin, production of IL-1 (Interleukin 1) and IL-2 (Interleukin 2) is diminished. Interleukin 1 protects against infection and Interleukin 2 regulates the activities of white blood cells [including T cells, B cells, neutrophils, macrophages and natural killer cells] responsible for immunity. When there is insufficient levels of Interleukin 2, stress-induced viral-bacterial-yeast-like-fungus that have pleomorphised in the body [in Phase 3 of Cancer: The Cancer Fungus] are now free to invade normal cells; damaging cell DNA through the release of "mycotoxins" within the cell nucleus, causing proto-oncogenes to mutate into oncogenes, and inhibiting tumor suppressor genes [notably p53] which results in normal cells mutating into cancer cells.